The New Zealand Food Innovation Network (NZFIN) is an accessible, national network of science and technology resources created to support the growth and development of New Zealand food & beverage business of all sizes. At Socius we have been working with them to create concise and meaningful case studies for publication on their website. Here are a couple of examples. The FoodBowl is always happy to assist local companies, but the best feeling of all is when the development done at The FoodBowl leads to a massive economic win for a region and for New Zealand. 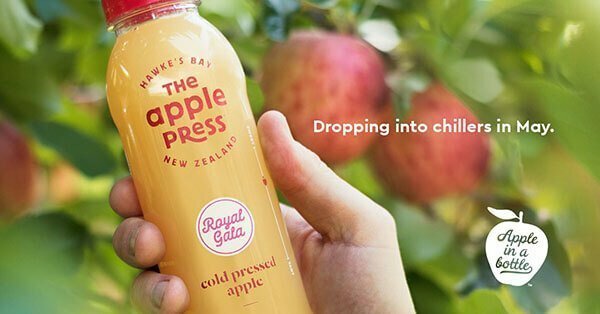 “The Apple Press” is a new Hawke’s Bay beverage brand that produces the world’s best apple juice and does it sustainably utilising the leftover “ugly fruit” that does not make export grade. The Apple Press (previously operating under the company name Apollo Foods) has built a state-of-the-art beverage processing facility in Hawke’s Bay to enable development of apple based beverages for NZ & export markets. Before the plant was commissioned, they needed to show they had a great product, one worth investing in and so came to The FoodBowl in 2014 to refine and test their juice processes and formulations. They needed to justify the business case for the new facility and be ready to go as soon as the plant was ready. The Apple Press uses fruit not “pretty enough” for export. Sally says the concept was “let’s make our juice look and taste like an apple” (with no preservatives or additives). Job creation is already considerable – three employees have become 40 in only 18 months. Sales turnover, although domestic only, has grown rapidly to >$500K since launch in April 2018. Export interest is high from a range of markets, and all going well there may even be a container on the water before Christmas. A chilled juice shelf life is generally 40-60 days, but The Apple Press process can increase this substantially. Thanks to the perfecting of an aseptic filling technique, there is no contamination from pathogens. It means a shelf life of 9 months, chilled for the Apple Press juice range. Food development is never without challenges: some variants were too acidic, others had colours that weren’t consumer-friendly enough. But there was shining success with Braeburn, Royal Gala and JazzTM – apples in a bottle. A run of 500 bottles at The FoodBowl has become 10,000 bottles an hour in Hawke’s Bay. (The plant capacity is circa. 50 million bottles per year). Finding the right investors who shared the same vision was also a challenge that took nearly a year to secure. Operational investment has been big, with the capital investment circa. $20 million, supported by Callaghan Innovation from the project outset. New Zealand’s unwanted (but delicious) apples have become sought-after beverage SKUs in Foodstuffs and Progressive supermarkets. This venture is poised to become a major export winner for New Zealand, and it all began at The FoodBowl. Sometimes great discoveries are just out of reach without quite the right technology to realise their potential. That’s why Supreme Health’s CEO Kerry Paul turned to The FoodBowl, with its state-of-the-art freeze-drying facilities. Kerry founded Supreme Health in 2017. Already its products can be found throughout New Zealand and he is exporting into Asia. What he’s working on in The FoodBowl could be the Next Big Thing. We know what antioxidants do; they take on the free radicals in our bodies that cause us health problems: accelerated ageing and a weakened immune system. It is a literal life crisis, albeit an invisible one, and to save us we need mighty molecules, the antioxidants. There is none mightier than the one at the front of the alphabet – Astaxanthin. Astaxanthin can take on (absorb) 19 different free radicals at the same time, maintaining its own stability by redistributing its own electrons; it’s fat and water soluble (so it’s active throughout the body). It can cross the blood/brain and blood-retinal barriers. It can penetrate the cell membrane, protecting a cell’s interior structures. Best of all, astaxanthin is ours. Kerry’s team harvest it from green algae in some of the purest water on earth – the South Island’s high-country lakes, rivers and streams. Astaxanthin has superpowers where other antioxidants merely have abilities. It is 6000 times stronger than Vitamin C, 3000 times stronger than Resveratol, more than 500 times more effective than Vitamin E or the catechins in green tea. But, you have to extract the astaxanthin from the algae, and it must be rigorously tested. Supreme Health harvests the algae strain Haematococcus pluvialis and encourages it to produce red Astaxanthin (AstaNZ™) in a controlled environment. 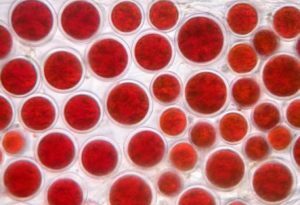 The development of astaxanthin is six months in, and when the product goes to market in its final forms, it has the potential to become a significant export earner for New Zealand.